9 Watt UV Bulb; Aquarium & Pond Germicidal, Review . What's in a UVC Replacement Bulb? If you have followed this blog/website for some time, you would know that ONLY a 254 nm HOT CATHODE LOW PRESSURE UV Bulb should EVER be used in your Aquarium UV Sterilizer, Pond UV Sterilizer/Clarifier, or Air UVC Purifier. *Hot Cathode vs. Cold Cathode UV Bulb; Are these worth purchasing? This is not to say that these higher output high quality UV Bulbs/Lamps are not easy to find, as they can be found. But not for prices much under $14-$15 and certainly not for $5.99 as some eBay sellers such as "Discount Aquatic" who have used ("copy & pasted") without permission information from premium UV bulb seller AAPs web page that implies their UV bulb is the same! BEWARE, a close observation shows the UV lamp/bulb these and other sellers is NOT THE SAME! Why spend the money on a UV Sterilizer only to put in a $5.99 blue light bulb?? Several manufacturers such as American Aquarium, Purely, & Phillips all sell ONLY hot cathode, low pressure 254 nm UV Bulbs that are also include the patented heat reducing technology or Norman lamps high efficiency, low heat/HO technology. 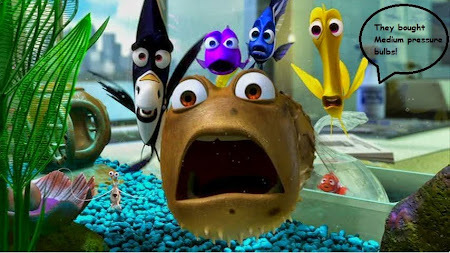 Unfortunately though, MANY if not most of the low cost UV Bulbs sold on eBay (such as the Jebao Brand commonly sold on eBay), Amazon (under the brand 'AnyRay'), Nextag under brand names such as Ocious are NOT these same low pressure, hot cathode UV Bulbs intended for level one UVC Sterilization in pond or aquarium applications, RATHER these are medium pressure UV lamps INTENDED AS NAIL CURING LAMPS with a UV efficiency of only 7%!! I am not necessarily accusing these sellers of fraud, rather most of these sellers find a source for the 'nail curing UV bulbs' and outwardly these look almost the same, but for a lower cost, so they see an opportunity to get a UV bulb for a lower price that they can in turn market at a lower price. Unfortunately most of these sellers would not know the difference between a low pressure UV bulb and a medium pressure UV bulb (again the later is only generally intended as a nail curing UV bulb). 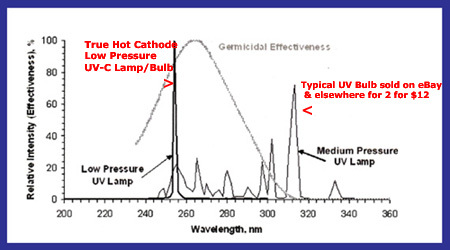 Quite bluntly these medium pressure nail curing 9 watt UV bulbs at 7% germicidal UVC irradiation simply CANNOT destroy the bacteria or maintain aquatic Redox at any useful/normal flow rate when compared to the high UVC output hot cathode UV-C Bulbs! Those purchasing a replacement 9 Watt UV Bulb will find this UV lamp to be one of the most common UV Bulbs sold incorrectly as replacements when in fact many are not for aquarium, pond, purifier use, despite advertising to the contrary! Many of these are simply are NOT going to do the job. These cheap 9 Watt UV Bulbs (often sold for under $10) are only useful for nail curing or similar, NOT to attempt to maintain Level 1 Sterilization in your important Aquarium or Pond UV Sterilizer! A source for good to premium UV Sterilizers: UV Sterilizer!! 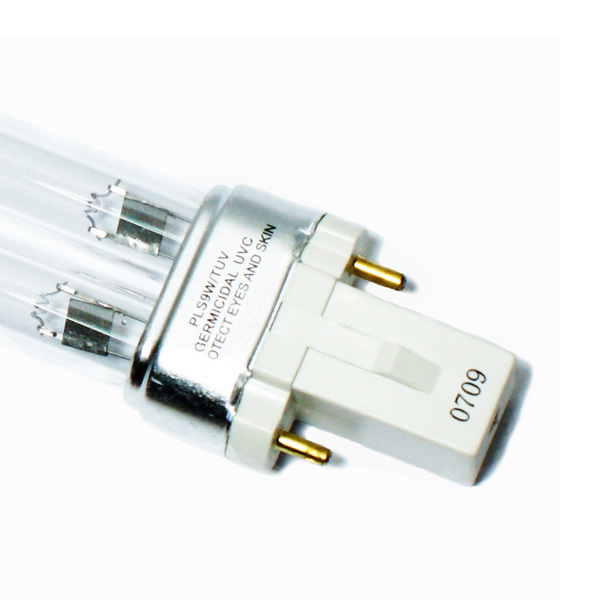 What is also noteworthy, although often difficult to find, is some 9 Watt G23UV Replacement Bulbs use patented methods to lower operating temperature which increases the efficiency and UVC output. THE FACTS ARE; the direct wholesale cost in volume purchasing is more than $10 for TRUE Low Pressure, Hot Cathode UVC Replacement Bulb/Lamp, so how is some Vendor going to sell these for much under $14 and pay the eBay seller fees, Amazon Fees, etc. (often offering shipping at below actual cost too), and still make a profit?? Of course the simple answer, which is not rocket science, is THEY CANNOT! This is why it is impossible to get a CORRECT TRUE Low Pressure, Hot Cathode UVC Replacement Bulb/Lamp at the prices offered on many of these websites that advertise on Google, etc. Another UV bulb that commonly comes up in search and is sold as less expensive alternative is the 18 Watt UV bulb/Lamp which it too is often a low output medium pressure UV Bulb with less than 7% UVC output. This is another instance one should be careful of picking the first UV Bulb that comes up in Google search and instead choose a true low pressure hot cathode. Simply put do NOT let Google, Bing, Yahoo guide you to one of these many websites selling these mostly useless UV Bulbs that produce little UVC necessary for an effective UV Sterilizer or Purifier. Spend a little more and purchase a American Aquarium, Purely, or Phillips 9 Watt Bulb, which often still only sell for $14 to $25 online. American Aquarium Products hot cathode 9 Watt is sold near cost as a promotional item and is THE true hot cathode, low pressure 9 Watt UV Bulb to purchase for both quality & price!! The bottom line is while you can certainly get a good deal for a good UV-C lamp/bulb, the old axiom still applies "THAT YOU GET WHAT YOU PAY FOR"! !